7:30 P.M, Friday night. 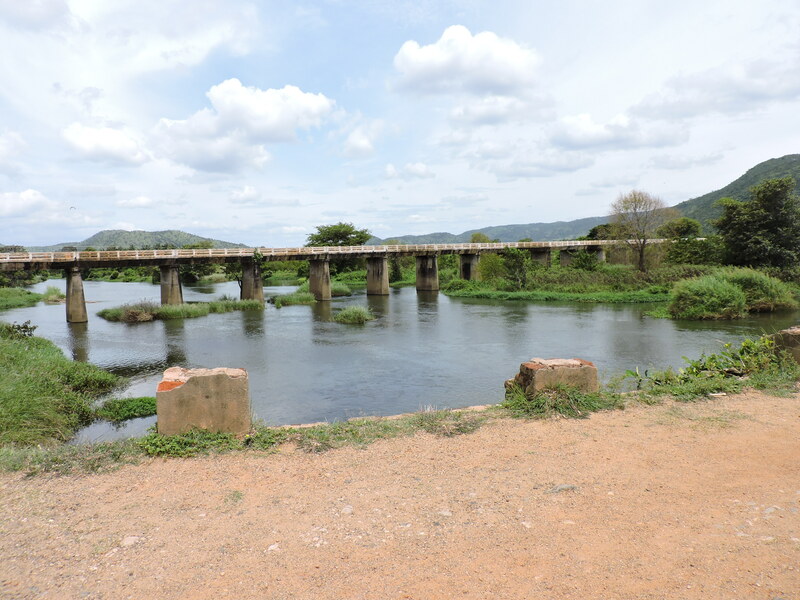 We were debating over the numerous one day trips from Bangalore when we finally settled on Shivanasamudra, the fourth largest delta formed by the Kaveri river. 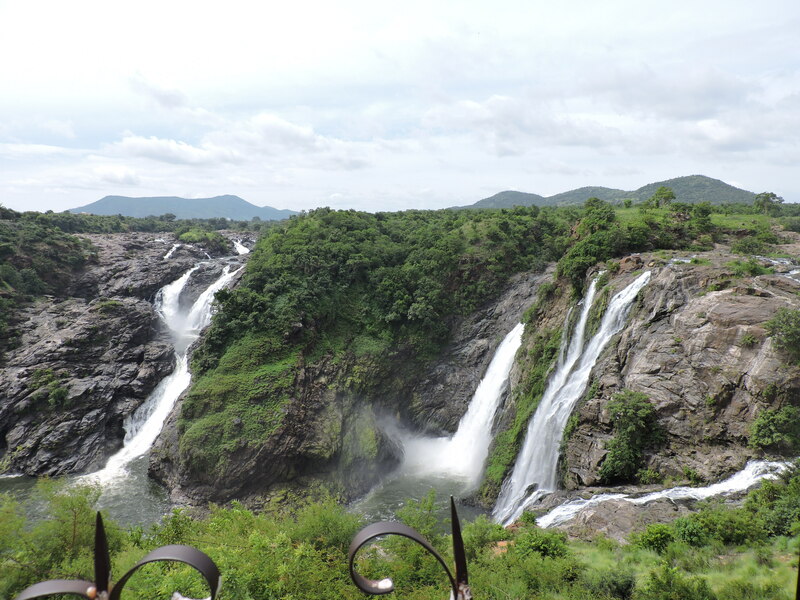 Shivanasamudra, literally translating to ‘Sea of Shiva’, is an island town where the Kaveri river bifurcates to form the Gaganachukki and Bharachukki falls. While the first lies in Malavalli, Mandya district, the latter is situated in Kollegal, Chamrajnagar. It also houses Asia’s first hydro-electric power station. It is about 130KMs from Bangalore and took us nearly 3hrs including a stopover for breakfast at Kanakpura. 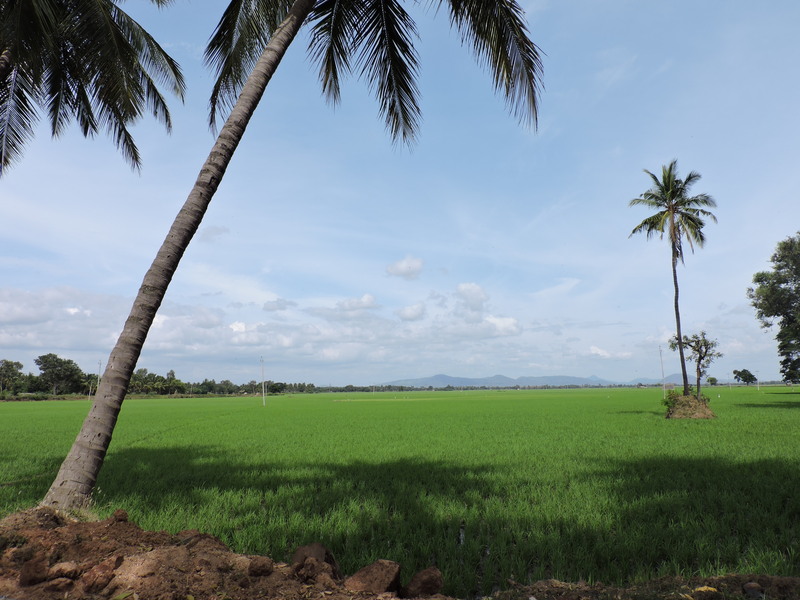 We passed through many villages and there was abundant greenery mainly paddy fields and corn plantations. There are two viewpoints for the Gaganachukki Falls: Darga Hazrath Mardane Gaib and the Shivanasamudra watch tower. We went to the watch tower viewpoint. The segmented waterfalls were a sight to behold. There was lush greenery around the falls, owing to the rains. A panorama from the view point presented the beautiful green hills around and the crystal clear waters, shrouded in mist as they fell. The falls weren’t very voluminous though. The Darga viewpoint was also visible from here. 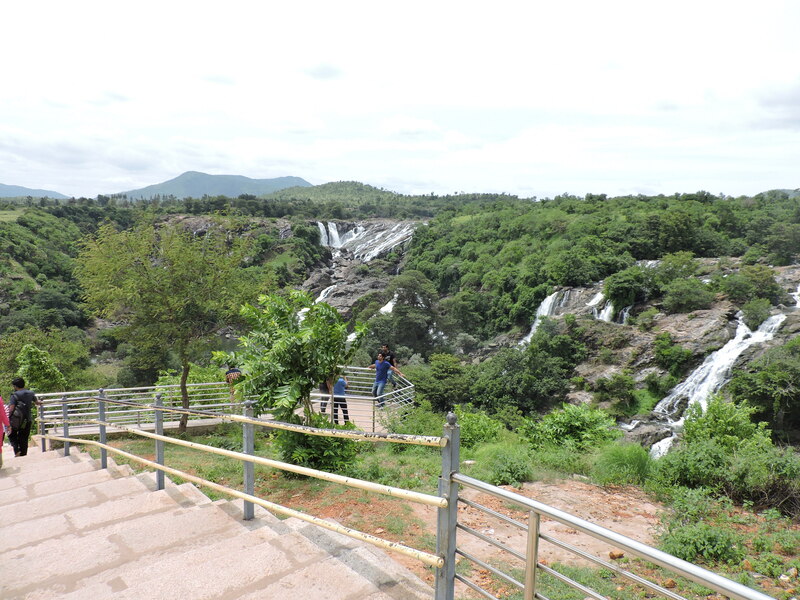 The Bharachukki falls are about 2KMs from the Gaganachukki falls. The Bharachukki falls seemed to fall from a lesser height but were wider compared to Gaganachukki. We had to take a number of steep steps before we could reach to the base of the falls. There were many visitors and it was more crowded as people were allowed to take a dip in the water here, unlike Gaganachukki. 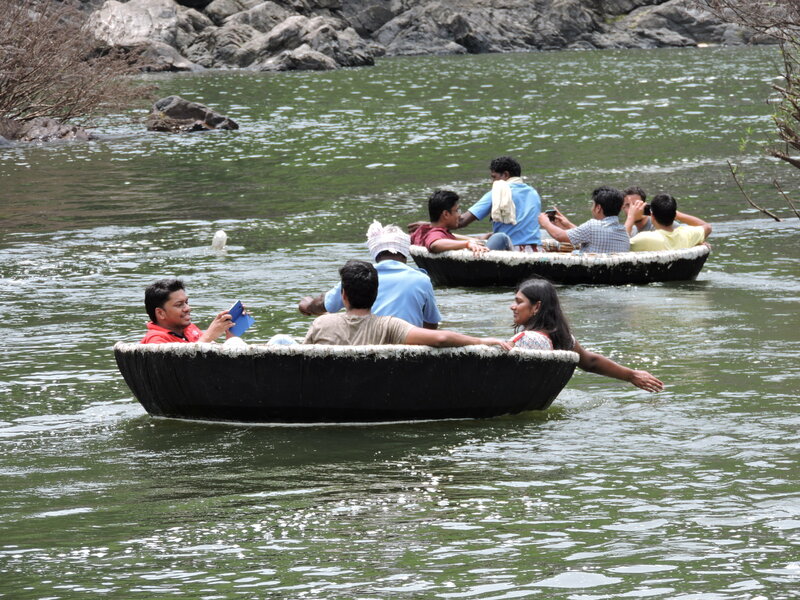 There were coracles(small round boats) that took the visitors for a tour around the segmented falls at the cost of Rs.100 per person. We took the coracle ride and went behind the small hill obstructing a complete view of the falls. Once behind, the area near the hill looked like a secret passage between two falls that led to some mythical kingdom. The boat man paddled us to the tip of each of the falls. We were splashed by the amazingly cool water which gave us some respite from the heat. Towards the end of the ride, he swirled the coracle letting us have a 360 degree (breathtaking) view of the falls and scenery around. We relaxed in the water for sometime and started to our next destination: Talakad. We stopped on the old bridge on the way back as it was very picturesque. Talakad, an ancient town about 25KMs from Shivanasamudra and famous for it’s sand temples, lies on the left bank of the Kaveri river. The legends about this historic town are numerous; like curses cast by the Mysore queen on the Wodeyar dynasty and the origin of the name Talakadu as a synthesis of names of two brothers Tala and Kadu, who became immortal. The journey to Talakadu was through villages filled with paddy fields and small lanes. It took us about 40mins to reach the entrance of the arch that led to the Kaveri river bank and the Vydyanatheshwara temple. The place inside was a picnic spot with small open air hotels, vendors selling toys, white sands, huge eucalyptus trees and creepers that formed swings between the trees. We had a traditional lunch that was served on banana leaves and proceeded to visit the famous sand covered temples. The way to the temples through the white sand dunes seemed like a dense forest because of the canopy of eucalyptus trees. Most of the temples have been buried under the sand but few have been excavated by the Archaeological Survey of India. 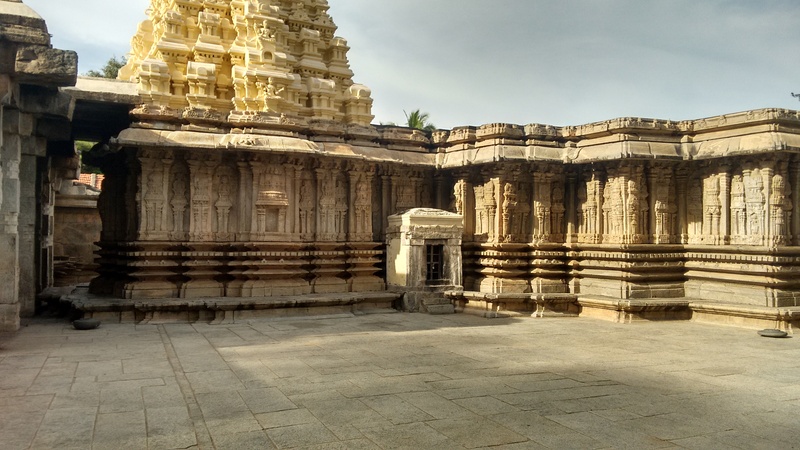 We visited the Pathaleshwara temple first, followed by Maraleshwara temple, Keerthi Narayana temple(which was being restored) and Vydyanatheshwara temple. The Pathaleshwara and Maraleshwara temples were very small compared to the other two. The localites told us that the Pathaleshwara temple has a brown Shiva linga unlike the usual lingams which are black. Except the Keerthi Narayana temple which has an idol of Lord Narayana, the rest are dedicated to Lord Shiva. I found the Vydyanatheshwara temple built in Dravidian style by Chola kings intriguing because of the beautiful stone carvings and grand looking idol. There are intricate carvings of Vishnu and Shiva on the outer walls and a carving of Ganesh riding his mouse. We then went to take a dip in the Kaveri river. The river bank was spread over a huge area making the river look more magnificent. The water was not very clean but on the plus side it was very cool and shallow, with the beautiful white sands in front and green hills behind. After many games of volley ball in the water and on the sand,amusing water fights and swimming lessons, we finally decided it was time to leave. Some of us might say that a black snake that we spotted in the water was the reason we came out. After the sunset,around 6:30 P.M, we resumed our journey back to Bangalore. Overall, Shivanasamudra is an excellent option for a one day trip. Do take the coracle ride if possible. I think going to Talakad with a group of 7-8 people is more interesting than going alone as it is more like a picnic spot where you can play games and have fun. Historians would find Talakad engrossing and rest can enjoy the nature and cool waters. Also, if you start a little early in the morning you can fit Somanathapura temple in your schedule. Route: There are two routes, either via Bangalore-Kanakpura road or the Bangalore-Mysore-Maddur road. We took the Kanakpura road. Cost: Approximately Rs. 800 per person including travel and food. We booked a Tavera and there were 8 of us. A toll of Rs. 20 had to be paid to the forest department at Bharachukki falls, Rs. 40 to the Gram Panchayat at Talakad, and Rs. 30 toll at Talakad arch entrance. There are not many food options available at Shivanasamudra, so carry food if you wish to. Also, the changing rooms at Talakad do not have facilities like lights and are inconvenient to use when it gets dark.